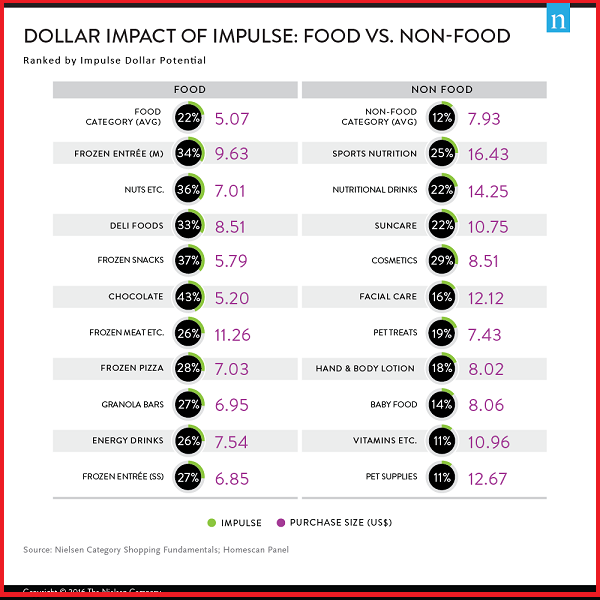 Frozen Foods, Snacks and Energy Drinks are the top dollar value drivers for Impulse purchases, according to Nielsen’s Category Shopping fundamentals research. 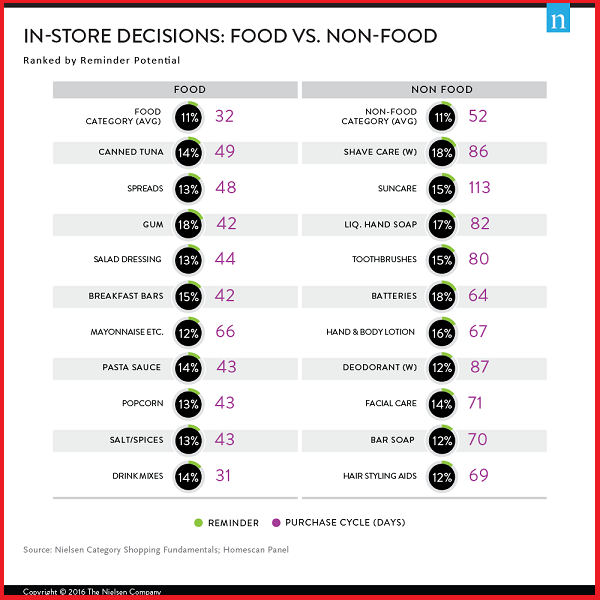 Category Shopping Fundamentals is an exhaustive research that examined 77,000+ purchases among 28,000+ respondents for 110+ CPG food and non-food categories. 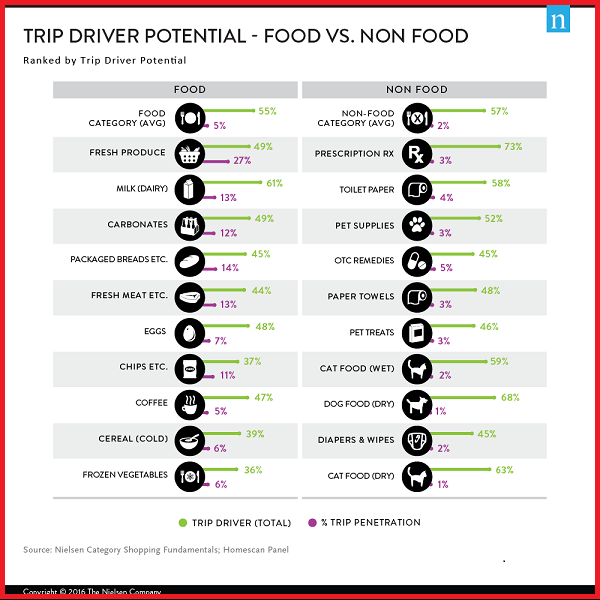 According to the research the categories that are the strongest driver for a shopping trip in the food category is fresh produce, beverages and eggs are the top drivers. Fresh Produce, milk and eggs are bought by consumers in 40 percent of all trips to the store. Additionally, in the non food space, customers bought prescription drugs and pet foods. Impulse buys that have the highest potential of driving in-store decisions, range from Food To Non Food items. Among the food items that are most likely to fuel purchases with in-store reminders are Tuna, Gum, Popcorn, Mayonnaise and Spreads. Non Food Items that have the highest reminder potential are sun-care and Deodorant. 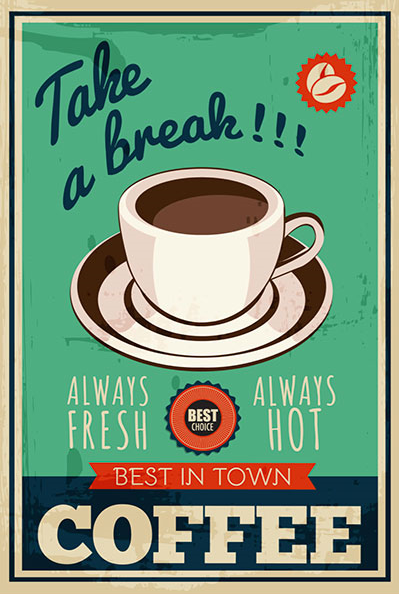 Posted in Digital, Insights, Social Media. Tagged Digital, Location-based, Mobile, Retail.